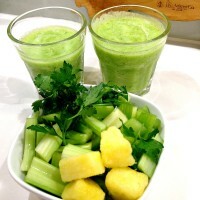 Green smoothies are surprisingly refreshing and make a great mid day snack or accompaniment to any meal. Parsley is full of vitamins A and C, has high antioxidant value and is important for heart health and the immune system. Parsley, a member of the carrot family, has also been shown to help protect against cancer. Put all ingredients with water into a vitamix or nutri-bullet blender.